How do the floats work? 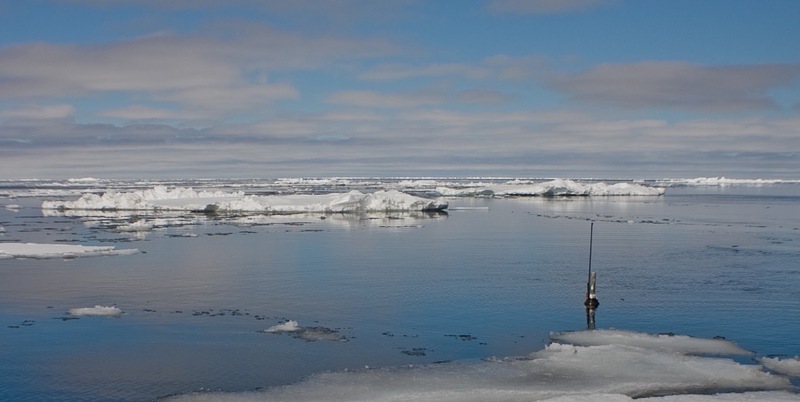 Temperature and salinity data from Argo are crucial for revealing climate trends in the ocean. WHOI is part of an international collaboration, with the goal of tracking the large-scale physical state of the ocean in real time and freely sharing this information. The WHOI Argo team calibrates, deploys, and tracks profiling floats that measure important ocean variables like temperature and salinity. The Argo Program, launched in 1999, is a global array of floating robots that collect information about the physical state of the upper ocean, including temperature and salinity. Argo has passed its initial target of 3000 floats worldwide, with over 3900 floats currently taking measurements. The basic goal of Argo is to track where heat and salinity are changing across the global ocean, down to a depth of 2000 meters. Argo sends that information to scientists and operational agencies in real time to assist climate and ocean research and forecasting. One of the original Argo member institutions, WHOI maintains about 10% of the global float array. The combined United States Argo program in turn operates 50% of the global array. To learn about the international program, visit the Argo Steering Team website. Meet the Argo team at WHOI. All Argo data are made freely available for use by scientists and the public. Find out how to download it. 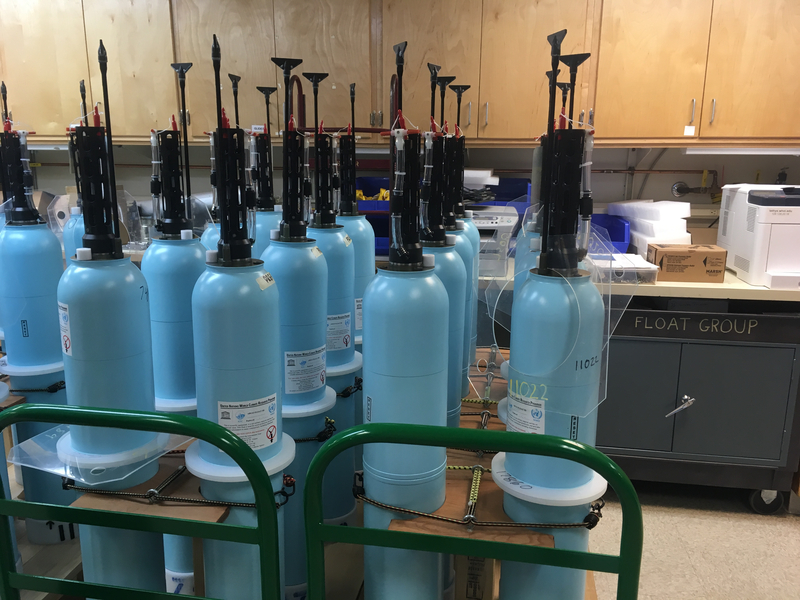 Learn how WHOI Argo team maintains and expands its fleet of profiling floats. Where is WHOI Argo now? 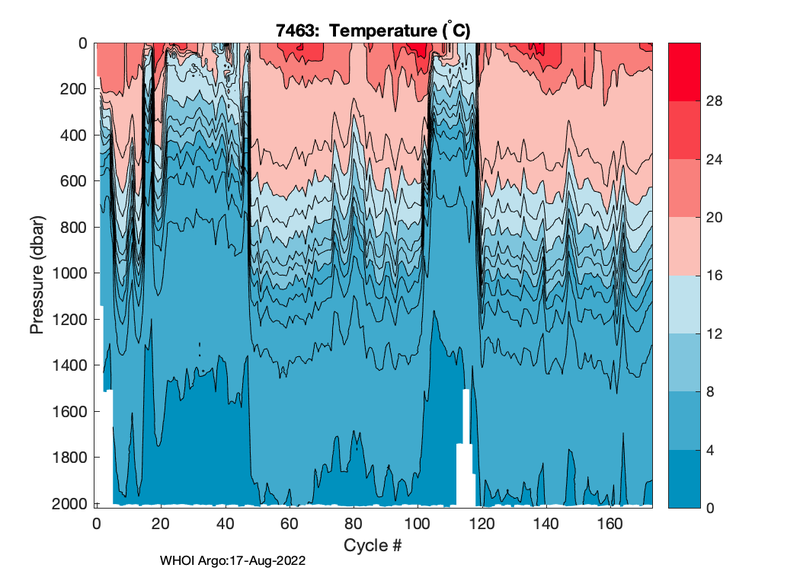 An example of an Argo temperature contour. This plot shows profile data from float 7463, an S2A float that was deployed in January 2018 off the coast of the southeastern United States and has traveled northward along the Gulf Stream.